422 pages | 32 B/W Illus. 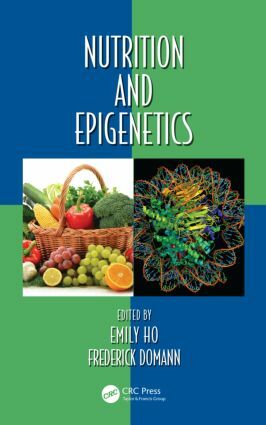 Nutrition and Epigenetics highlights the interactions among nutrients, epigenetics, and health, providing an essential resource for scientists and clinical researchers interested in nutrition, aging, and metabolic diseases. Dietary Effects on Adipocyte Metabolism and Epigenetics; Kate J. Claycombe, Huawei Zeng, and Gerald F. Combs, Jr.
Emily Ho is the endowed director of the Moore Family Center for Whole Grain Foods, Nutrition and Preventive Health. She is a full professor in the College of Public Health and Human Sciences, with an emphasis in nutrition, and is a principal investigator at the Linus Pauling Institute at Oregon State University. She joined the Oregon State University faculty in 2003 after receiving her Ph.D in human nutrition from the Ohio State University and completing her postdoctoral research at Children’s Hospital Oakland Research Institute and UC Berkeley. During the course of her career, Dr. Ho has published 97 peer-reviewed articles and abstracts and four book chapters. She has been invited to give more than 40 presentations and has mentored more than 40 undergraduate and graduate students. She currently serves on the editorial board for Journal of Nutritional Biochemistry and Frontiers in Epigenomics. Her research interests are in the area of antioxidants and gene expression and dietary chemoprevention strategies. More specifically, she focuses on the effects of zinc status on DNA damage, DNA repair, and stress–response signal pathways. Another major focus in her laboratory is investigating the genetic and epigenetic mechanisms by which foods such as soy, tea, and cruciferous vegetables may protect against prostate cancer. Frederick Domann is a professor of radiation oncology in the Free Radical and Radiation Biology Program at the University of Iowa. He is a distinguished alumnus from the University of Wisconsin where he earned his Ph.D in 1991 in human cancer biology under Kelly H. Clifton, studying radiation-induced thyroid and mammary carcinogenesis. He subsequently pursued postdoctoral research at the Arizona Cancer Center with G. Tim Bowden, where he studied the redox biology of gene expression. He joined the faculty at the University of Iowa in 1993 and has since become an internationally recognized expert in free radical biology, cancer metabolism, and epigenetics. His work has led to more than 140 peer-reviewed publications. Dr. Domann codirects the Free Radical Cancer Biology Program in the Holden Comprehensive Cancer Center at the University of Iowa. He serves on the Councils of the Society for Experimental Biology and Medicine and the Society for Free Radical Biology and Medicine. He is the recipient of the mentoring awards from the Radiation Research Society and the Graduate College of the University of Iowa. His research interests include transcriptional regulation, redox metabolism, and epigenetics of human diseases including cancer.